Mango trees can grow to 30 feet if allowed to grow naturally. Unpruned mango trees will produce fruit high up in the tree where it is difficult, and sometimes impossible, to harvest. Trees left unpruned may also produce less fruit than trees that receive regular pruning. This is because the tree uses resources for growth that might have otherwise been used for fruit production. If you are planting a new mango tree, plan your pruning to ensure good tree health and fruit production. Allow young mango trees to grow without pruning for the 4 years after planting, according to University of Florida Extension. Prune to improve tree form and encourage lateral branching in the plant's fifth year. Prune after fruiting season, but before major new growth has begun. Use pruning shears to on branches 1/2 inch in diameter or smaller. Use a pruning saw on larger branches. Remove any dead or dying wood or branches. Prune these branches by cutting them back to living wood. A heavy freeze can cause branches to die back without cold protection. Texas A&M University Extension recommends waiting to determine the extent of the damage before pruning. 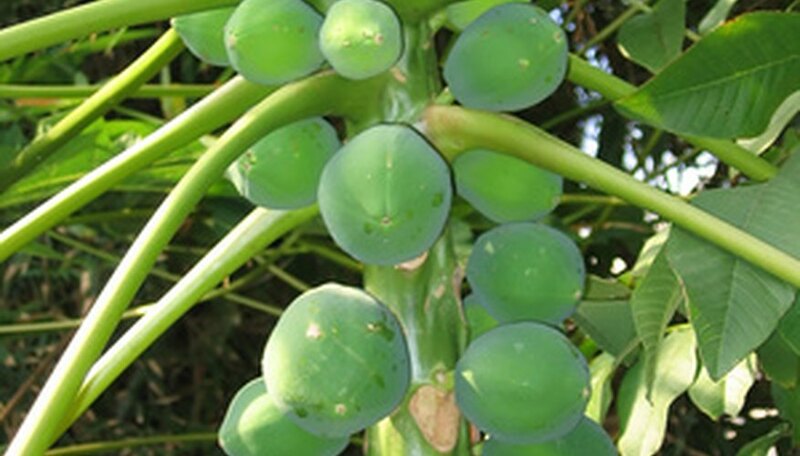 Top the tree after the tree reaches 12 to 15 feet to encourage growth in lower branches and ensure that the fruit is low enough on the tree for easy harvesting, advises University of Florida Extension. Depending on your needs, you might consider limiting tree height to as low as 6 feet. If pruning branches larger than 1 inch in diameter, consider making a cut two-thirds of the way through the branch from the bottom and finishing the cut from the top. This will reduce the risk of splintering as the branch drops. Use caution when pruning full gown trees, especially trees that are between 12 and 30 feet tall. For trees that have not been pruned and are very large, consult a professional arborist for advice and pruning services. Severe pruning, such as topping a taller tree down to 12 to 15 feet, will not injure the tree, but may lead to reduced fruit production for a season or two.